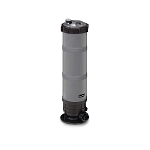 Cyclonic filtration dramatically reduces filter maintenance! This filter package offers simplicity and savings! Don't need the cartridge filter? Check out the TJ-16 Typhoon on its own. STAGE-ONE: The Typhoon pre-filter from CircuPool is the ultimate time-saver. 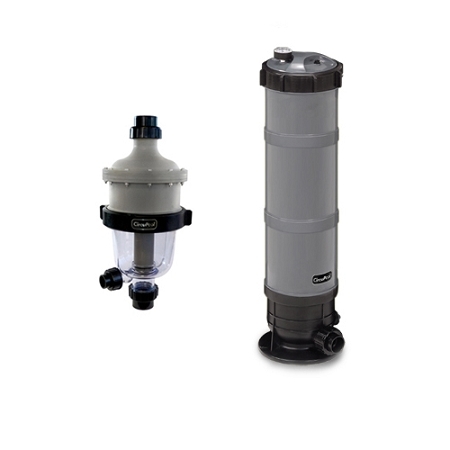 Using your existing pump and filter, the Typhoon turns your ordinary equipment into a sophisticated two-stage filtration system that delivers sparkling clear pool water and all but eliminates filter cleanings. With no moving parts to wear out and no electrical components, the Typhoon literally spins the dust and dirt out of your pool water. Installation is an easy, ten minute do-it-yourself project for most homeowners. The Typhoon mounts on top of your pump so it fits right in to any equipment pad and, the threaded couplings ensure free-flow operation on all pools. 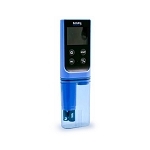 Certified salt-pool safe: Compatible with all types of pumps and filters. 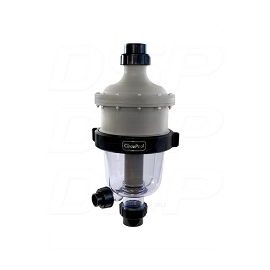 STAGE-TWO: The CircuPool CJ-150 Cartridge Filter is compact, dependable, and convenient, providing 150 sq ft of filtration surface area. The CJ-150 will handle pools up to 18,000 gallons by itself - and when teamed up with the CircuPool TJ-16 Typhoon Pre-Filter, will handle up to 30,000 gallons. With only a 9" waist, the CJ-150 fits easily in tight spaces. Best of all, sparkling, crystal-clear water is virtually guaranteed. What a awesome combo! Been using these two filters for about 6 weeks, and my pool is clear as glass! I love the prefilter - you can see it working and I purge it clean in a few seconds whenever I found myself back there. It has maid things pretty effortless. The filters are fine, I was just expecting a bigger discount once I got both of these. Replaced my old hayward microclear DE filter a few months ago and WOW what a difference. I absolutely hated dealing with the DE powder and all the maintenance my filter took. Now, I have yet to even need to clean the new cartridge filter and the prefilter is so crazy easy to clean. Best part is I think the water looks better than the DE filter kept it too! Q: Is it necessary to purchase this two filter system with the classic combo RJ45 Plus Sait system? 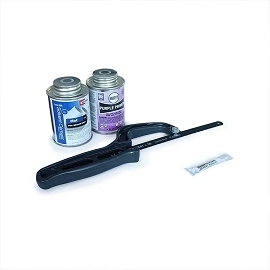 Easy no-tool maintenance, easy cleaning. Durable, high-impact polypropylene body construction can withstand the harshest conditions. Molded glass-filled polypropylene lid with easy-open lock ring. Built-in, automatic airbleed. Non-corrosive, non-sticking air relief valve. Versatile unions work with 1.5" and 2" plumbing, provide maximum flow. TJ-Series Pre-Filter: Manufacturer 2 Year Limited Warranty. CJ-Series Filter: Manufacturer 1 Year Limited Warranty. All warranties offered are provided by the relative manufacturer and are limited to the terms and proration they provide. See manufacturer's documentation for a full description of warranty terms and conditions.